Which firms have reputations for developing superior C-level marketing leaders? And which firms provide the best training that enables marketers to become CEOs? These are two common questions I get from marketers, executives, and students. To understand which firms best develop C-level marketing leaders, I conducted a study with Christine DeYoung, partner at DHR International, an executive recruiting firm. In that research, we asked executive recruiters to identify the firms that have the best reputation for developing C-level marketers (see the list here). Through that study, we found that not all marketing jobs are the same (see this Harvard Business Review article for more insight). Executive recruiters indicated that some companies have better training and development programs--and importantly, view marketing as the leading function of the function--and that provides a better foundation for C-suite success. What distinguishes the firms that made the Top 15 list is that they tend to: 1) leverage marketing as a P&L function (as opposed to a staff function that serves the firm’s P&L function), 2) operate in highly competitive markets (providing a more challenging environment to learn how to engineer growth), 3) have a sustained track record over time for developing marketing talent, and 4) ensure enterprise-wide learning and leadership. In aggregate, these firms are “go-to” companies that executive recruiters turn to for talent because they have greater confidence in the training, know-how, and competency of employees “educated” at these firms. Since that first study, there has been significant interest in understanding which companies and industries have the best track record for turning marketers into CEOs. Just like attending certain elite MBA programs increases the chance of landing at a top, blue-chip company, working for certain companies can increase the likelihood of attaining an eventual CEO role. These companies often have excellent vetting processes (ensuring they hire top talent to begin with) and a superior, time-tested system for training marketers to think and behave like CEOs. To better understand which firms excel at converting marketers into CEOs, I conducted a study using LinkedIn data (see methodology below), calculating the percentage of marketing alumni by firm that are currently CEOs (i.e., the ratio of CEOs to marketing alumni by firm). Below, I rank the firms and then the industries within which the top firms operate. Procter and Gamble (P&G) came in at the top of the list, with over 20% of all of the CEOs with marketing experience in the LinkedIn sample coming from P&G. As an example of a P&G marketer-turned-CEO, consider Michelle Gass, the current CEO of Kohl’s, who started her career at P&G and then worked at Starbucks (another top company that prepares marketers to become CEOs). Stewart Stockdale worked at P&G in brand management and ultimately became the CMO for Conseco, Inc. before becoming President of Western Union. He currently serves as the CEO of J.G. Wentworth and is on the board of directors for PayClip Inc. Patrice Louvet served as the Group President, P&G Beauty (in brand management) and currently is the President and CEO of Ralph Lauren. And Paul Polman, CEO of Unilever at the time of analysis (recently retired from the role), worked at P&G in various roles for over 27 years. Other examples from consumer packaged goods (CPG) firms include Jeff Watters, currently the President and CEO of Ainsworth Pet Industries, who worked at Kraft, Heinz, and Clorox. Ron Coughlin is currently the CEO of Petco and formerly the CMO of PepsiCo. Trevor Bynum, currently the CEO of Welch’s, worked at General Mills in various marketing roles. Francis Britchford Allen, currently CEO of Boston Market, worked at PepsiCo in a number of roles. What’s interesting is the number of people who have worked for more than one of these firms during their careers. Brian Hansberry worked at P&G and Heinz and is currently CEO of Nonni’s Foods. Gass, above, worked at both P&G and Starbucks. Watters, above, worked in a number of the ranked firms. And John Costello, who became President/CEO of Zounds and served on the board of Ace Hardware, worked at P&G and PepsiCo. 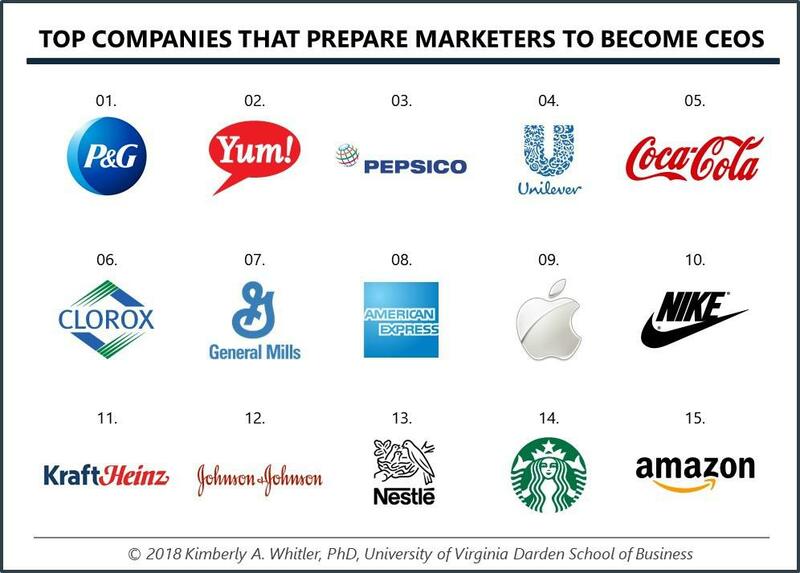 While it isn’t surprising that CPG tops the list for producing marketing talent who move into CEO roles (see here for some insight), what may be surprising is that the “Retail Food” industry, driven by Yum! Brands (KFC, Pizza Hut, Taco Bell), comes in second. Over 12% of Yum! Brands’ marketing alumni are CEOs. For example, Ralph Bower, currently the CEO of The Melt and formerly the CEO of Pei Wei, worked at Yum! Brands for roughly 6 years earlier in his career. Looking at industries beyond CPG and Retail Food, Nike is the only company on the Top 15 list from apparel. Davide Grasso, former CMO of Nike (and VP of Global Football Marketing), is currently the CEO of Converse. From healthcare, Johnson & Johnson produced Ron Wilson, who ultimately worked as President of Aramark (Refreshment Services Group) and currently serves as CEO of GoodWest Industries. Mary Anne Heino, who spent more than 17 years in a variety of roles at J&J, is currently the President and CEO of Lantheus Medical Imaging. Below, I share marketer to CEO conversion by industry. To do this, I separated the firms into eight different industry segments and then compared the average marketer to CEO ratio of each segment. Given that more than half of the Top 15 Firms are from the CPG industry, I separated the companies that primarily compete in food and beverage-based categories (i.e., PepsiCo, Coca-Cola, General Mills, Kraft Heinz, Nestle) from those that don’t (i.e., Procter & Gamble, Unilever, Clorox). 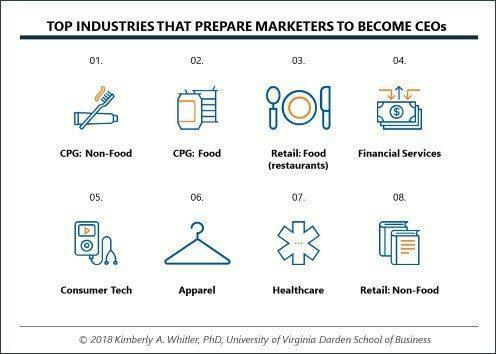 Of the eight industries represented, both types of CPG firms earn spots at the top in terms of producing marketers that go on to become CEOs (see below). The third best industry segment is retail-food (i.e. restaurants) fueled by Yum! Brands and Starbucks. The fourth best industry is financial services (i.e., AMEX), while consumer tech (Apple) comes in fifth. The sixth is apparel (Nike), the seventh healthcare (J&J), and the final industry segment is non-food retail (Amazon). What may be most illuminating is the number of industries that aren’t listed. From energy to consulting and professional services to non-profits to a number of different areas within tech and many more—none are represented at the top. In many cases, the explanation given by executive recruiters is that those who go on to become CEOs typically come from the P&L side of marketing—and there are relatively few industries (and firms) that treat marketing this way. For more insight on the different types of marketing roles, see this HBR article.